We are pleased to introduce the Stiebel Eltron Tempra and Tempra Plus Series tankless water heaters, the most advanced thermostatically-controlled electric tankless water heater ever made. Unlike most other brands, the Stiebel Eltron tankless water heater constantly monitors the incoming water temperature and flow rate and modulates power to the heating elements to maintain a precise output water temperature as selected by the user for unsurpassed temperature control. A variety of models are available to suit a wide range of point-of-use and whole-house residential and commercial applications. 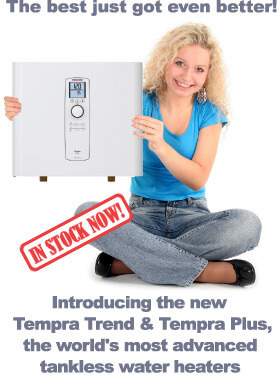 The Stiebel Eltron Tempra and Tempra Plus Series tankless water heaters can produce up to about 6 to 7 gallons per minute of shower temperature water (depending on model selection and climate) on an on-demand basis while providing energy savings of 30 to 50% compared to most conventional electric tank water heaters. Moreover, Stiebel Eltron tankless water heaters are backed by a comprehensive warranty and technical support program. Stiebel Eltron has been in business since 1924 and with more than 2,200 employees and one of the only ISO-9001 certified electric tankless water heater manufacturing facilities in the world, you can purchase with confidence knowing that decades of experience and quality engineering has gone into every unit! We are also pleased to offer the Energy Star rated Stiebel Eltron Accelera 300 heat pump water heater, the highest rated water heater of its type available today. Our staff collectively have more than 40 years of experience in the tankless water heater business and our company is one of the largest authorized Stiebel Eltron distributors in North America. We are pleased to assist you with model selection and advice with respect to the best configuration to meet your needs. Call us toll free at 1-877-374-2696. All Stiebel Eltron tankless water heaters are ETL Listed in the USA and Canada, ensuring they conform to all applicable safety standards. Replace your hot water heater with an energy-efficient Stiebel Eltron Electric Tankless Water Heater today!